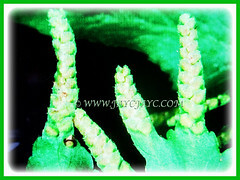 The Japanese Climbing Fern or Vine-like Fern sprouts easily via spores. Also, it spreads vegetatively via underground rhizomes. It has been reported as an invasive plant by USDA in southern Alabama and Florida and is known to overgrow existing vegetation. Botanical Name: Lygodium japonicum (syn. : Ophioglossum japonicum). 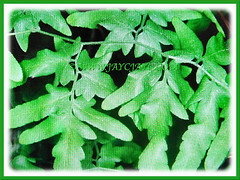 Common Names: Japanese Climbing Fern, Climbing Fern, Vine-like Fern. Origin: Native to eastern Asia including Japan, Korea, southeastern Asia, India and northern to eastern Australia. Also, it is cultivated worldwide. 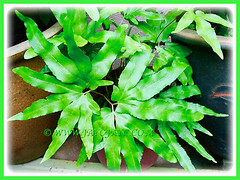 Plant type: An ornamental and perennial fern or vine. 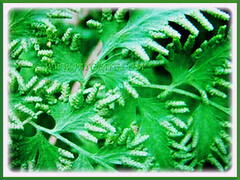 Features: Lygodium japonicum is a genus of Lygodium which consists of about 40 species of ferns, occurring mainly in the tropics. It is the sole genus in the family Lygodiaceae. This fern produces a creeping stem from which grow very long leaves. The plant can reach about 2.5 m tall with the fronds reaching about 10-20 cm long. The leaves have rachises which are vine-like and may climb other vegetation. It has twining and threadlike stems with pinnate papery fronds. There are two types of leaflets, sterile and fertile. The sterile pinnae consist of lobed segments called pinnules on 1.5-3.5 cm stalks, triangular to lance-shaped segments.The fertile pinnae on 1-2 cm stalks are narrow and 3 times divided with frond more intricately divided and has fringed segments. Fertile fronds bear sporangia that produce tiny, wind-dispersed spores. 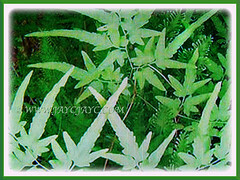 Petioles borne 2-7 mm apart, 10-35 cm with ultimate segments ovate to lanceolate, fringed with fertile lobes, otherwise similiar to sterile segments. It is lined with sporangia on the edges. The plant reproduces via spores and spreads vegetatively via underground rhizomes. This plant does not produce flowers. 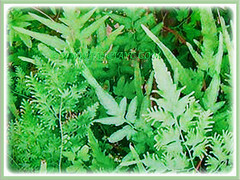 Culture (Care): Lygodium japonicum or Japanese Climbing Fern can be easily grown with minimum care. Light: Light shade to heavy shade. However, spores are produced only on portions of the plant that is exposed to the sun. Soil: Humus-enriched, loamy and well-drained soils. However, any type of soil is okay, provided it drains well. 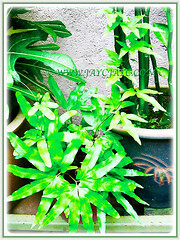 Others: Prune the foliage to keep it tidy and aesthetically pleasing. A hardy plant that is generally free from serious disease or insect problems. Nevertheless, it is susceptible to fungal pathogen that may cause sever damage to leaflets. 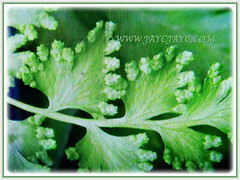 The cold hardy Lygodium japonicum or Japanese Climbing Fern makes an attractive basket plant. 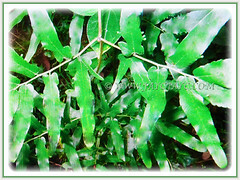 Climbing ferns are tough and able to grow back readily after droughts, freezes, and fires. A perennial vine that is deciduous in colder climates and dies back in the winter when expose to frosts. The soil should be kept moist at all times and if they are allowed to dry out, the top of the plant dies back to the perennial roots. During the growing season, the plants are fertilized on a weekly basis with a balanced fertilizer. During the winter months, water just enough to keep the foliage from browning. Repotting should be done in the spring before new growth begins. These plants are best used to create lush tropical atmosphere in northern greenhouses and atriums where their spores cannot escape to establish weedy infestations. Propagation: By division or by spores. The ripe spores can be collected on a piece of paper. They germinate best at a temperature of 20-21°C in 6-7 days. Generally, the spores remain viable for several months. 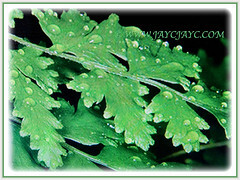 Usage: Lygodium japonicum or Japanese Climbing Fern is used to enhance tropical atmosphere in atrium gardens, interiorscapes and landscapes. Great too for container gardening. This tough vine can lend an enthusiastic tropical tone to indoor landscapes and conservatories. It is used as a traditional medicine in certain regions as a diuretic, to treat colds, inflammation, kidney tone and renal ailments.